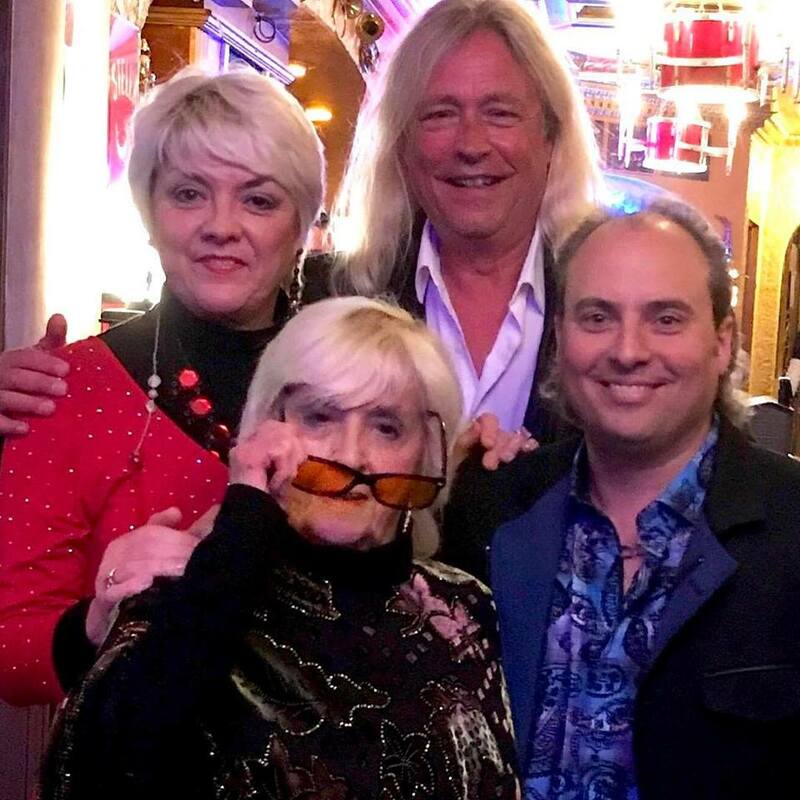 From time to time, “rock royalty,” at least in my opinion, graces our stage at The Arcada. Icons like Pat Benatar, Boz Scaggs, Burton Cummings, Chuck Berry, Buddy Guy and many more leave me stuttering when I speak with them. Earlier this week, I experienced true rock royalty as I attended the Paul McCartney concert (at The Arcada, maybe one day!) at the Hollywood Casino Amphitheatre in Tinley Park. The cool part of this was that I was invited to go to this Beatle-iffic presentation by none other than Paul’s old bud, Denny Laine, founding member and guitarist from of The Moody Blues and his former band WINGS. “Hey Ron, I’m in town this week. Would you like to join me to see Paul on Tuesday?” was the call I received from him. After I got up from the floor, I enthusiastically accepted his gracious offer. So we get to the concert and are immediately escorted backstage. There he was, my buddy, Denny. We have worked together on many occasions, including a “songs and stories” night coming up at Club Arcada. For two hours we listened to all that great Beatles/WINGS music, with Denny chiming in here and there behind-the-scenes stories about the songs. Chills ran up and down my spine as Paul magically performed 39 songs including classics and a couple of newer tunes. “A Hard Days Night,” “Eleanor Rigby,” “Blackbird,” “Lady Madonna,” Live And Let Die,” “Can’t Buy Me Love,” “Let Me Roll It.” Just so many iconic hits! When Paul played “Band On The Run,” everybody around us applauded Denny and yelled out his name out of respect to the guy who played guitar on the original recording of this and the other WINGS’ hits. It was actually quite emotional. I was very happy that Denny got the respect he deserved, although it would have been better if Paul would have asked him up on stage! But as I was “in the moment,” I got to thinking really how iconic these songs and this guy McCartney is. I looked out at the sea of over 30,000 screaming fans, singing along to every song. I saw 6-year-olds with Beatles’ shirts on mouthing every word to “Hey Jude.” There were 90-year-olds clapping somewhat to the beat of the music. There were soccer moms dressed in their cutest bell-bottom jeans. There were dads with bellies hanging out of their 1972 concert shirts. All in all, people of all ages and types getting their Beatles/WINGS groove on. I then realized just how lucky I am to be in the business that I am in. Over the years, one way or another, I have had one-degree of separation with the Beatles on several occasions. A couple years back, when Ringo was inducted into the Rock and Roll Hall of Fame, I had the opportunity to meet him. I was there to celebrate Joan Jett’s induction, but found myself at Ringo’s table! My back was up against Yoko Ono who was at the next table, so I got to speak with her for a minute. Then later, I was standing next to Sir Paul and we jammed to the live performance by the band “Green Day,” both of us exchanging pleasantries about the band and live music in general. Cool, huh? Jan. 9, 2014, was the 50th anniversary of The Beatles’ performance on The Ed Sullivan Show. Louise Harrison, George’s sister, was there that night. She actually nursed George back to health as his fever from a flu almost stopped him from performing. A stand in had already rehearsed with the rest of the guys! 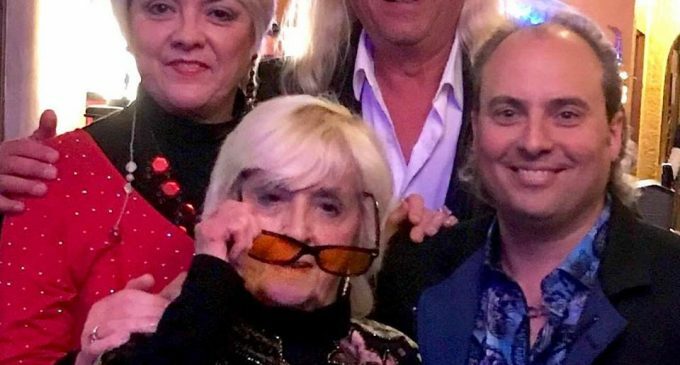 Louise has become a good friend of ours over the years, appearing frequently with “The Liverpool Legends,” a Beatle’s tribute act. Because of our friendship, she chose to be with us for a “Songs & Stories” show on the 50th anniversary to the minute. We were honored! Alana Parsons, another frequenter of The Arcada stage, was a 19-year-old sound engineer at Abby Road Studios and was very much involved with The Beatles’ last concert together which occurred on the rooftop at Abbey Road. Of course, original guitarist and founding member of not only The Moody Blues, but also The WINGS, Denny Laine is one of our most frequent performers. Angie McCartney, who married Paul’s widowed father, Jim, in 1964 as The Beatles’ careers were taking off, also had a daughter Ruth McCartney, who legally became Paul’s (and his natural brother Mike’s) stepsister. We recently had these two ladies at The Arcada who talked about Paul and the boys from 1964 on. Fascinating stuff! There are so many ways The Beatles’ could be connected to other performers, many of whom have appeared in one way or another at The Arcada. In my humble opinion, there is no other band in music history that has influenced fellow musicians or touched more music fans than The Beatles. Elvis, Michael Jackson, Frank Sinatra and everyone else included. And in the end, the music they made is unequaled to the music that anyone else in history can claim.